I love perfumes. And, I only buy selected perfumes because I can be very picky when come to perfumes. My perfume must be fresh, not very sweet, not overpowering, good quality and makes me happy when I wear it. So, everytime before I buy a perfume I will do a big research first. I will check their notes and reviews. So, before I end up with my Chanel Coco Mademoiselle, I was researching for perfumes and I was looking something fresh and feminine and classy. After all the google search I did, I end up at a Perfume's Shop with two perfumes on my mind. And, none of it is Chanel Coco Mademoiselle. When I asked the shopkeeper to show me testers of the perfumes I was planning to buy, he immediately gave me. But when I smell them, they did not attract me. I was kind of disappointed. When the salesguy saw my disappointment, he asked me what I am looking for. I told him I want something fresh but not very strong until gives me headache. 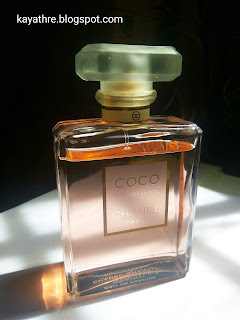 He straightaway suggested me Chanel Coco Mademoiselle. I hesitated a bit because I did not do any study about it. But, he said I wont regret if I buy it because it will not only make me happy but it will make everyone around me happy too. I was attracted to that statement and asked to see the tester. Once I smelled it, I got really happy. It was similar to what I had in my mind. I immediately bought it without a second thought. Since then, I never miss wearing this perfume for my office and events. Chanel Coco Mademoiselle is by Chanel and launched in 2001 and created by perfumer Jacques Polge. Its top notes are Orange, Bergamot and Grapefruit. Heart notes are Lychee, Rose and Italian Jasmine. Base notes are Indonesian Patchouli, Haitian Vetiver, Bourbon Vanilla and White Musk. It is incredibly sensual, yet sophisticated. You will keep going back to it over and over again!